Please type your desired tags, e.g. Chemistry, Genomics, Systems and Computational Biology, MRI, Online Education, Accounting, Motherhood & Reproduction, International Development, Mathematics, Gender Studies, Women’s History, Leadership, Trope of monstrosity in literature and film, US History, Texas History, Eighteenth century French intellectual and literary history, and etc. 2006–2006	W. Hu, 231st ACS National Meeting in Atlanta, Georgia, March 26-30, 2006. 2008–2008	L. Tao, C. Nelson, S. Ramachandran, L. Overzet, M. Goeckner, G. Lee, and W. Hu, Stability of nanostructured DLC molds for nanoimprint lithography, MRS Fall meeting, Nov. 2007. Recognized in Nanotechnology in Focus on Obducat.com, 09/2006. Student Travel Award, IEEE International Conference on Nanotechnology, 2004. Outstanding Leadership Award for Oversea Students and Scholars, Consulate General of the People's Repulic of China in Chicago, 2001. Session chair of Nanoimprint lithography, 54th International conference on Electron, Ion and Photon Beam Technology and Nanofabrication (EIPBN), Anchorage, AK, June 2010. Steering committee member of Nanoimprint Session for 54th International conference on Electron, Ion and Photon Beam Technology and Nanofabrication (EIPBN), 2010. Session chair of Nanobiology, 53rd International conference on Electron, Ion and Photon Beam Technology and Nanofabrication (EIPBN), Marco Island, FL, May 2009. Technical Director of Bioelectronics, Chinese Institute of Engineering - DFW Chapter, 2009-2010. Session chair, TexMEMS VIII conference, Richardson, TX, 2006. $330K, National Science Foundation (NSF), "Lithographically defined nano-morphology in polymer-fullerene solar cells", P.I., 05/15/2009-05/14/2012. $200K, Texas Instruments, Additional funding to "Defined nanoscale Si sensors as cancer diagnostic devices", P.I. (with E.M. Vogel, Yves Chabal, and J. Gao), 5/01/2009-5/01/2010. Material donation ($158K), ST Microelectronics Inc, 06/2009. $223K of $2.2M, Department of Defense, "Nanotechnology in cell therapy", co-P.I. (with J. Willson, J. Gao), 2009-2011. $50K of $100K, Medical Technologies Consortium, "Microfluidic Assays Embedded with Silicon Nanowire Sensors for Assessment and Prognosis of Prostate Cancer Metastasis," Co-P.I. (with Jung-Chih Chiao, Sanjay Awasthi, Jinming Gao), 1/01/2010-12/31/2010. $40K out of $200K, NIH-SBIR subcontract from Lynntech Inc, "Ultrasensitive, Label-free Silicon Nanowire Biosensing Arrays", 02/2009-02/2010. $15K, American Academy of Otolaryngology, "Functionalized nanotubular polymeric particles for targeted cancer imaging", Co-P.I. (with B. Sumer, J. Gao, K. Brown), 7/2008-7/2009. $200K, Texas Instruments Inc., "Defined nanoscale Si sensors as cancer diagnostic devices", P.I. (with E.M. Vogel and J. Gao), 4/01/2008-4/01/2009. $250K, Moncrief Foundation, Dallas, "Nanotubular Capsules for Ultra-sensitive Breast Cancer Detection", P. I. (multi-PI with J. Gao), 10/06-open. $150K, Air Force through AFOSR/Spring Program, "High-density nanoscale organic light emitting diodes by nanoimprint technology for near-field biosensing", P.I., 10/06-4/08. $15K, UT Dallas-UT Arlington collaboration fund, "Advanced DNA Microarray Technologies based on Homologous Strand Exchange and Magnetic Nanomanipulation", Co- P.I. (with S. Levene and P. Liu), 04/06-04/07. $360K of $6M, Consortium Of Semiconductor Advanced Research, Korea, "Next Generation Semiconductor Technology - Equipments/Materials", Co-P.I. (with 6 others), 09/07-08/11. A UT Dallas researcher envisions a time soon when plastic sheets of solar cells are inexpensively stamped out in factories and then affixed to cell phones, laptops and other power-hungry mobile devices. And a new $330,000 grant from the National Science Foundation should help him come closer to realizing that vision. 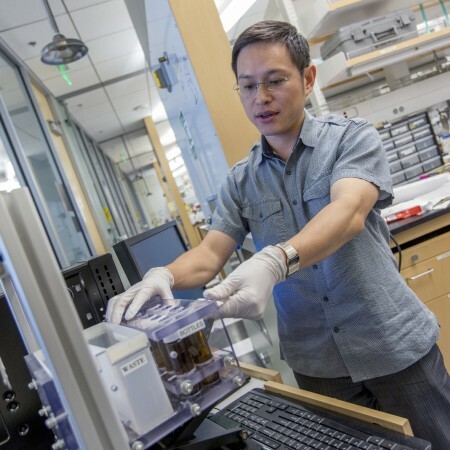 Many researchers are investigating the development of flexible solar cells in hopes of improving efficiency and lowering manufacturing costs, however Walter Hu’s novel approach would use nanoimprint lithography to produce precisely nanostructured devices rather than using chemical methods of manufacturing. UT Dallas had a record number of invention disclosures, patent applications and licensing agreements in the past year, a result of the University’s growing efforts to transfer commercially viable research results from the lab to the marketplace. 66 invention disclosures, a 40 percent increase over FY11. 10 licenses and option agreements.